I asked what the meaning of the left and right side during zazen practice could be? Dogen Zenji recomends sitting with the leg foot over the right foot, and the left hand covering the right hand. Why doesn't he mention the opposite way of sitting? The main stream interpretation arrives at the conclusion that Dogen Zenji wants to sit us in gômaza, the yin dominated, demon subdueing posture in either half or full lotus posture, both hands and feet. And this is usually explained by the fact that we sit still in meditation (yin), trying to pacify the demons in our mind. Kichijôza on the other hand by some is said to be reserved for enlightened buddhas that have already subdued their minds and are now actively using their enegries to help others (yang activity). The questions I raised: Is our practice really passive (yin) and do we have to wait until enlightenment before we become active (yang) and help others? Do we have to be buddhas to sit with the right side up? 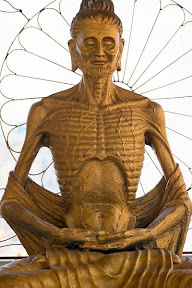 Also: If it is true that kichijôza is reserved for enlightened buddhas, how come that Shayamuni was depicted with his right foot up even when he was still striving for enlightenment, i.e. before he became a buddha? Why on the other hand are some (but very few) buddhas depicted with their left feet up? The examples I know are of Vairocana Buddha. On the practical side, other questions might be more relevant. Like: Does it really feel more ying to sit with left side up? Does it change anything in the conciousness? Like say, taht the right half of the brain (being connected to the left side of the body) is activated when we sit in gômaza, and that we think more with our left brain when sitting in kichijôza? If that was the case, it would be understandable that Dogen Zenji would recommend one way over the other, at least if the New Age people are right in believing that the right half of the brain, the emotional, inspirational, female half, is somehow "better" than the rational, calculating, logical male side (left side) of the brain. How about the hands then? For most, the issue of the hands will not be as urgent as that of the feet, as the hands usually do not hurt that much. If you are left-handed or right handed doesn't matter so much, you probably can sit with the left hand covering the right hand without much problems. I also sat with my left hand up for more than 20 years without even thinking about trying the other way. Only when I was wondering if there might be any physical evidence to the yin/yang side interpretation did I start to experiment with sitting the other way around, holding my right hand above my left hand. I thought: Maybe it is really true that my right, guiding, dominant hand, being connected to my left brain, is more yang. By covering it with my left hand during zazen, maybe I become more "yin" tempered. But how about in the winter? There are times when the temperatures in the meditation hall fall down to freezing point, and after an hour you lose the feeling in the hand that is up (i.e. the left hand). Shouldn't that mean that my right (yin) brain gets paralyzed and I am all yang now? What if I switched the hands and warm my left hand up, while the right hand is in the cold? What I realized was, that it really made a difference during breakfast after two hours of zazen: If both hands had stayed out in the cold for about the same amount of time, I could still open and handle the eating bowls properly. If only one hand was out all the time, on a cold morning that hand would be completely numb and holding my bowls was not so easy. But apart from that, I did not feel more "yin" or "yang" depending on which side was up. I found though, that it helped my shoulders to switch hands, just as it helped my pelvis to switch feet. Although the hands themselves don't hurt, always having the same hand one centimeter higher than the other can make a difference for the shoulders on the long run. On the left you see a picture of a young Deshimaru. 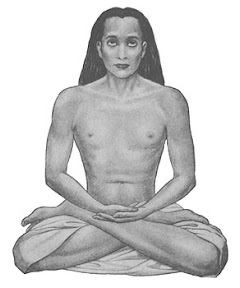 He is sitting with his right foot over the left foot, but with his left hand covering the right hand. 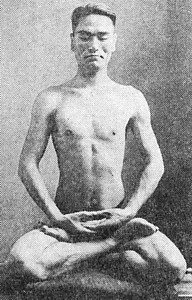 Although Deshimaru had the reputation of having an excellent physical posture, it is obvious that his hands are not straight, but that the left wrist is held higher than the right. The left shoulder is also held higher than the right shoulder, which seems more relaxed. This is caused by the fact that the right foot, resting on the left thigh and supporting the left hand, ends up sitting higher than the left foot below it. This would probably be the same with pretty much anyone who is sitting: The hand that is placed on the foot that is "up" will be higher than the other hand. I therefore think that Deshimaru is right in placing the hands in the opposite way than he places the feet. If he was wearing his robes he would need just a little more support of the sleeves under his right hand. Some teachers recommend that you just follow Dogen and always sit with your left hand up. Others say that if your right foot is up, you should also have your right hand up, and the other way around. It is true that if your right foot is up, it supports your left hand, which in turn supports the right hand. Still, I do not think that this "right foot up=right hand up/left foot up=left hand up" posture is a good idea, because then the weight of both hands rests on only one wrist that is supported by only one foot. If you place the lower hand in the cavity that is created by the lower foot, and than the higher hand on top of the higher foot (as Deshimaru does in the picture), the weight is distributed much more even. The picture I took about 18 months ago represents the orthodox Dogen way of sitting: Left side up for both hands and feet. Personally, I now recommend to either switch the feet in this picture, or have the left hand covered by the right hand. In this picture, the whole weight rests on the wrist of the right hand, which will become tired over time, because the left hand is floating in the air without any support of its own, except for the right hand. Because of this, the strain on the left shoulder is also higher than on the right shoulder. But now back to the original question: Why do we have kichijôza and gômaza in the first place, and how - if at all - do they differ? The answer is of a historical and geographical nature. In India, the right hand is considered the "pure" hand. You eat with the right hand, while you wipe your arse with the left hand, which is "impure". Therefore, in India it is no more than commen sense to cover up one's left ("impure") hand with the right ("pure") hand. Yin and yang played no role at the time of Shakyamuni. Therefore all buddha statues (and other statues that show someone enlightened or not enlightened in the lotus posture) that originate in India show the right hand up. 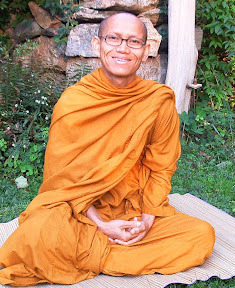 Even today, when you sit in the Theravada tradition, you will be told to place your right hand on top of the left hand, because that is what everyone did since the time of the Buddha in India. Just look at the pictures below, Shakyamuni as an ascetic on the right, Mahavatar Babaji, a modern Yogi, in the center and "Happy Nipen", a present-day Theravada teacher on the left. Things changed when Buddhism was transmitted to China and was influenced by the Taoist tradition there. Right and left were no longer "pure" and "impure", but "yang" and "yin", and just as it was common sense to cover the left side with the right side in India, it was common sense in China to have the left side up when sitting in a motionless (yin) state. And from China Dogen Zenji got his instructions of zazen, and obviously seeing no reason to change the part on the legs and hands (he did some changes in the part on the mind though), he just kept faithful to the Chinese tradition. Chinese sculptors in most cases kept faithful to the Indian custom of having the right hand up in statues (this was explained by the fact that these were statues of buddhas who had transcended somehow from yin to yang), but there are a few exceptions with the left hand up, representing the Chinese thinking. And I think that is all I can say about crossing the legs. As far as placing the toes high up on the thigh (so that they are in line with the outside of the thigh) is concerned, I recommend: If possible, stick to the letter of Dogen. As far as the left and right side is concerned, I say: Switch between the feet and also try switching the hands, trying to balance them so that they are straight and that the weight does not rest on only one wrist. If the hands aren't straight, you might have problems in the shoulders as a result.